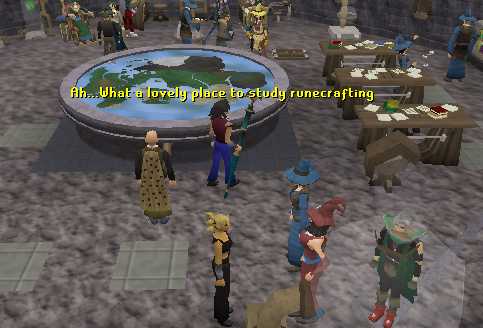 After an adventurer re-discovered the lost skill of Runecrafting, some wizards decided to come together and found the Runecrafting Guild. They chose to devote themselves to help each other and players understand the skill. The location of the guild is not like others. 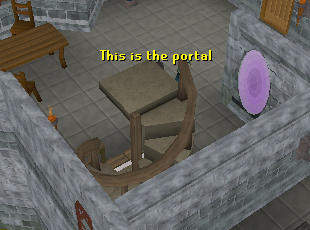 It's only accessible through a portal on the second floor of Wizards Tower south of Draynor Village. A few methods of teleportation access somewhere around the tower. If you have started the A Fairy Tale Part 2: Cure a Queen quest, you can use Fairy Ring code DIS. 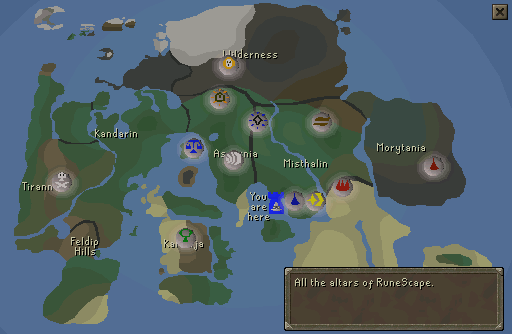 You could also use an Amulet of glory teleport to Draynor and simply walk southeast along the coast. Alternatively, you can use the cabbageport teleport from the Lumbridge Tasks and walk east through Draynor village, and then south to the tower. There is also a teleport in the Magic Guild that leads the the tower. 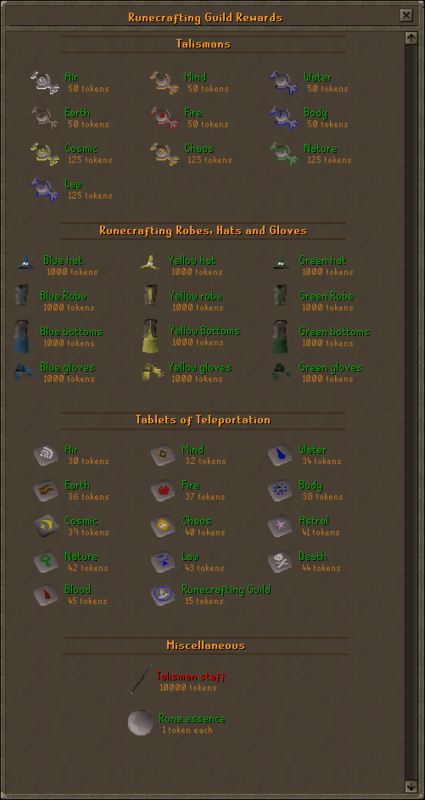 Alternatively, you could teleport to Lumbridge using the home teleport spell on the normal spellbook. Lastly, you can buy a Runecrafting guild teleport tablet from Elriss for 15 tokens. 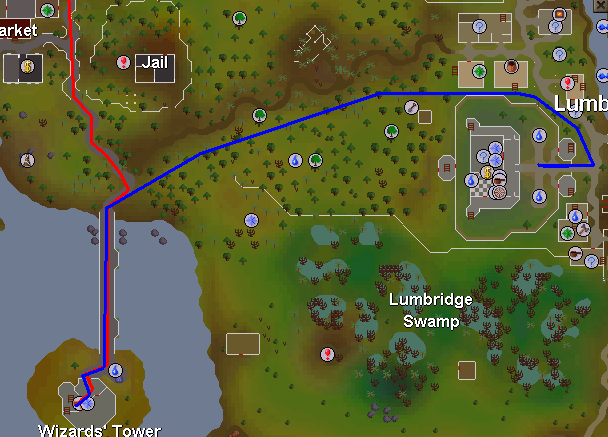 The blue path is walking west from Lumbridge after home teleporting. The red line is walking from Draynor after teleporting using the Amulet of Glory. Once you find it, you're in! This being such a small guild, doesn't have as many features as the others. However, this is certainly not like the other guilds. This is helpful if you aren't familiar with talisman locations. To use it, simply use a talisman on the box and the location will display on the map. If you use an Omni-talisman on the map, all of the altar locations will display. If you look around closer, there are many machines whirring and sparkling and turning. These have no purpose but for pure fun. Here are some notable and helpful people found inside the guild. 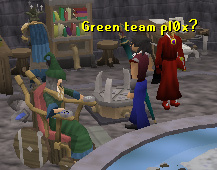 Talk to her to join the green team of the Great orb project Activity. She is the head of the guild. You can exchange your guild tokens for prizes explained in the Great Orb Project guide. You can also get xp for showing her talismans. Show her enough and she'll reward you with an omni-talisman. He is a somewhat unstable and easily frightened wizard. 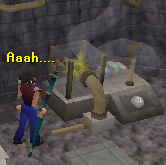 He can repair your Runecrafting pouches, and he replaces medium pouches free of charge. He charges 9,000 gp for large pouches, and 12,000 gp for giant pouches. You can also buy large pouches from him for 25,000 gp and giant pouches for 50,000 gp. He also fuses the omni talisman into a staff and regular talismans into the runecrafter staff. Talk to him to join the yellow side of the Great Orb Project Activity. This is probably the guild's most popular feature. It is an Activity revolving around teamwork. There are two teams of five, the yellow and the green. 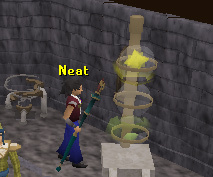 Acantha is the green team leader and believes that the power of runecrafting altars comes from green energy while Vief, the yellow leader, says that the source of their great power comes from yellow energy. The two teams are placed together in a tactical Activity to get as many as their energy team color into the altar as possible. When you win you are rewarded with tokens. If you lose, you are awarded with a smaller amount of tokens. Here is a list of the rewards. You can read more about this in the Great Orb Project guide.